The Christ Church war memorial commemorates those residents of the Metropolitan Borough of Paddington who sacrificed their lives during the Great War (1914 -1918). Designed by Sir Walter Tapper RA and sculpted by Lawrence A Turner, the memorial was erected on the footpath outside Christ Church and originally unveiled on 27 March 1921 by the Bishop of Kensington. The memorial is in the gothic style. The tabernacle below the gilded metal crucifix accommodates eight niches with statues. The figures are of St. George of England, St. Louis of France & the warrior saints of Christendom, being Maurice; Longinus; Victor; Adrian, Florian and Eustace. The grade II listed memorial was severely damaged during the storms of October 1987. Westminster City Council has restored the monument and moved it to its present location as part of the Lancaster Gate street improvement scheme. The restored memorial was unveiled on 11 November 2002. 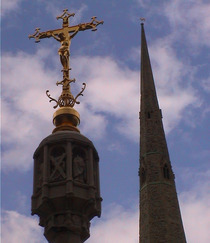 Originally erected on the footpath outside Christ Church and unveiled in 1921. Severely damaged during the storms of October 1987, it was restored by Westminster City Council and unveiled in its present location on 11 November 2002. Bishop of Kensington 1911 until his death.